Are you looking to purchase a home for your family in the beautiful Wilmington area? We have several local real estate agencies and agents that are very knowledgeable about our area and would be more than willing to help!! "Locally owned and operated...where good service is our first priority!" 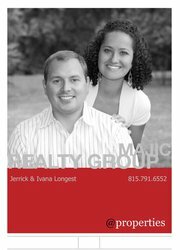 Majic Realty Group is owned by Wilmington residents Jerrick & Ivana Longest. Lifelong residents of the area, they are knowledgeable and experienced in Wilmington's residential community and all that it has to offer.